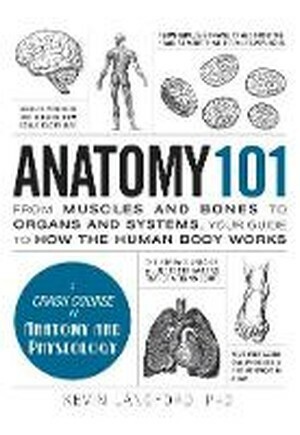 An all-in-one guide to the human body!Anatomy 101 offers an exciting look into the inner workings of the human body. Too often, textbooks turn the fascinating systems, processes, and figures of anatomy into tedious discourse that even Leonardo Da Vinci would reject. This easy-to-read guide cuts out the boring details, and instead, provides you with a compelling lesson in anatomy. Covering every aspect of anatomical development and physiology, each chapter details the different parts of the human body, how systems are formed, and disorders that could disrupt bodily functions. You'll unravel the mysteries of anatomy with unique, accessible elements like:Detailed charts of each system in the bodyIllustrations of cross sectionsUnique profiles of the most influential figures in medical history From cell chemistry to the respiratory system, Anatomy 101 is packed with hundreds of entertaining facts that you can't get anywhere else!